Syrup Rack - Rack Only. 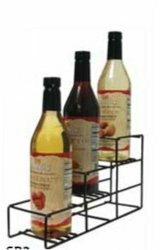 Keep you Torani Sugar-Free Syrups organized with this 3 tired syrup rack. Each bottle sits just higher than the one in front of it to make it easily accessible and viewable. Works great with the pumps on the bottles or without. (Syrups not included with the rack). Syrup Rack - Rack Only (Bottles Not Included). Keep your syrups organized and viewable with this tired rack. Works great with the syrup pumps or without.